Should you Have A Hair Transplant Without Propecia? Does Propecia Have Side Effects? We have a community poll, but I would like to hear some direct input. Everyone who has used or is using finasteride do you experience side effects? Does Propecia Have Side Effects? My father in law is 84 years old. 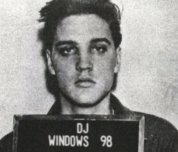 Lost most of his hair over 30-40 years ago. Top of his head was completely bald like a pool ball, since I met him over 16 years ago. Yet he started to have hair re-growth within the past 12 months. The following is the medications list that he takes for his various ailments: Quetiapine 25 mgFinasteride 5 mgRosuvastin 20 mgRamipril 5 mgSynthroid 0.05 mgAcetaminophene 500 mgAmlodipine 2.5 mgApo Ismn 60 mgClopidogrel 75 mgDonepezil 10 mgFolic Acide 5 mgMethotrexate 10 mgPantoprazole 40 mg Quetiapine is the medication that he started to take about 8 months ago, and that I think is responsible for his hair regrowth. Yes, I know he also takes finasteride (for his prostate treatment) which is known for its hair growth ability, but he had taken it for a few years now, same as for his other medications. I don't know Quetiapine alone can help with hair growth or it is with combination of the other medications. This is up to our Pharmaceutical companies to do some research on it. We may need to rethink about the common knowledge that says that hair can't be regrown back once the follicle died. Because it is clearly not the case with my father-in-law. This question has been circulating and well the biggest difference is that one is FDA approved for hair loss and the other one isn't, but some users swear by it. According to the studies I have read it seems like the difference in terms of hair growth and density is nominal with Dutasteride being slightly higher. However, the side effects are also slightly higher, in the end I think most men do just fine with Finasteride. I encourage everyone to take sometime out of their day to have a read and share with others. What's the difference between Avodart and Propecia? Is Propecia Safe To Use? Hey Guys, This can be a bit of a controversial topic, but I get so many questions as to why I stopped using Propecia and whether it is safe to use, well the fact is that yes for the majority of men it is safe to use, but that doesn't mean that it is side effect free. At the end of the day, it is a personal choice whether to use Propecia, just like it's a personal choice to have surgery. What do you guys think? Is Propecia Safe To Use? What Are The Best Budget Hair Loss Treatments? 4700 Total FUE Grafts by Dr. John Diep. 4 Year Update! On August 3rd 2014, I underwent my first FUE hair transplant, performed by Doctor John Diep of Los Gatos, California. Dr. Diep transplanted a total of 2,460 grafts in the front half of my head. He recreated my hairline and added grafts further back to increase density. The result was fantastic (link: https://www.hairrestorationnetwork.com/topic/39774-2460-fue-hair-transplant-by-doctor-john-diep/), so I decided to quit using Minoxidil. I knew I'd pay for it, but decided that a second transplant to restore healthy hair in my problem area would be far better than taking Minoxidil for life. A quick side note; Minoxidil made my face puffy and caused deep creases/wrinkles to form on my forehead. On November 17th 2015, Dr. Diep transplanted an additional 2,220 grafts (link: https://www.hairrestorationnetwork.com/topic/43867-second-fue-ht-by-dr-diep-2220-grafts-to-improve-density-4700-grafts-total/). Enough said. Here is my update. Just 3 weeks shy from my 4 year hair transformation anniversary. Thank you so much Dr. Diep, you're truly a master and have made me a calmer and happier person. This 29-year-old patient had prior FUE sessions in the frontal region and midscalp areas of his crown. The FUE procedures included beard FUE grafts into his midscalp. He desired more hair in his crown, but his donor reserve was limited and - in his 20s - he was almost certain to have more thinning in his donor region. This patient received 2 PRP sessions as well as the daily use of the topical hair growth blend (HGB) provided by Dr. Wesley. The images depict the patient before and about one year after initiating this non-surgical therapy. Hair loss from steroids -- transplant? Hi guys, Hi, I've always had a head of thick, curly hair. All my life I suffered from depression, but when I turned 20 it was at its worst. I made the stupid mistake of taking steroids as a means of getting some control over my life through my body. After a year on steroids I realised how foolish I had been, and stopped. When I truly registered the irreversible damage I had done to my hair I began taking Finasteride and Minoxidil. This has halted the hairline recession that the testosterone caused. Prior to the use of testosterone, I never experienced hair loss. My question is: Given the the fact that I didn't lose hair before taking high dose testosterone (500-750mg) and the fact that Finasteride and Minoxidil have halted the hair loss, should it be okay for me to get a small hairline transplant without having to worry too much about chasing my hairline? - Obviously I do not expect to return to my original hairline, as I know this would look unnatural at an older age. I simply want to add a bit to my hairline to hide some of the damage I have done. PS - I have attached a photo of my current hairline (shaved the sides, usually they are bushy) and a photo of my old hairline from 3 years ago. PS again - please do not flame me for using steroids. I was in a very dark place and did not consider the consequences. I know exactly how stupid it was, and have learned from my mistakes. Just registered so i could post but i have some questions regarding sebborheic dermatitis and finasteride. Probably a NW2. 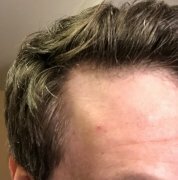 Im 24 years of age and have only really noticed rapid hair loss in the crown and temples in the last two years. I have currently been diagnosed with sebborheic dermatitis and appears in my scalp, t zone, eyebrows and above my lip in my beard hair. I would say it is pretty mild in the sense that i manage it by using apple cider vinegar topically regularly which usually keeps it at bay for 2 days before i need to treat again. Through my high school years i did suffer from ocular rosacea but manage to grow out of it until the last 3 years where seborrheic dermatitis has formed but could be a relapse of rosacea or both possibly. As i said im very on top of it by watching certain foods i eat and treating regularly. To the point exactly, im worried that potentially taking finasteride will exacerbate my seb derm and maybe make it harder to handle. If anyone has any input or insight that would be awesome as this is mainly reason i am reluctant to take fin as i have read that some people have broken out after a couple years of use. So if i have it now would it get worse potentially? I started taking finasteride at the beginning of the year. Before I did, I got a baseline test of many of my different hormone levels (everything was in the normal range). I initially took 1mg and noted fairly immediate sexual side effects. I then lowered it, and stared taking 1/4 of a pill every other day (so basically, 0.125mg). I noticed some occasional sides, but nothing too dramatic. After 3 months, I got my DHT level checked and started taking 1/4 pill every day (0.25mg) and noticed some increased side effects. I just got my test results back, my DHT level went from 63 ng/dL before finasteride to 12 ng/dL while taking 1/4 eod: 0.125mg. My question is, is that an effective drop in DHT, enough to result in the cessation of hair loss? And if so, should I drop back down 0.125mg, or go off of it until the sides are gone before starting back up at just 0.125mg? Thanks. Finpecia From 'AllDayChemist', Legit Or Counterfeit? Good Afternoon, I recently ordered Finpecia from AllDayChemist and it has come in 3 tables in a row instead of 2 in a row (my friend has 2 tablets in a row with his) Is this normal or is my Finpecia counterfeit? Hi guys, Have been lurking on these forums for a while, finally making it official and joining. Posting this here and another couple of the forums because I haven't seen much about it yet, but have any of you read about, used, or found suppliers for topical finasteride? I've had the side effects many of you have and stressed about continuing to use it orally but I found some studies that show the topical looks very promising and could be effective without the side effects. Any thoughts or recommendations? Is the generic fin (I think it's called Proscar) actually any worse than the regular one? Is it at all worth paying the extra money? I have always kept a very natural lifestyle and am not interested in taking any medication in perpetuity. I'm also concerned with potential sexual side effects to the point I've ruled out taking it. I'm getting a 1600 graft FUE session next month and will take minoxidil afterward to ensure the new grafts take hold and to minimize shock loss. But I expect to stop taking in after about 6 months, and never Finasteride / Propecia. Has anybody done this? And how did it affect your outcome. Many thanks. Ok not the product. Just generic Finasteride. Wish me luck! My Dr hooked me up with the 5mg one.